Bangalore is blessed with over 300 days of sunshine a year. So when we decided to consolidate our two existing offices in Bangalore, we looked for a building that would allow us to set up a solar plant on the rooftop. 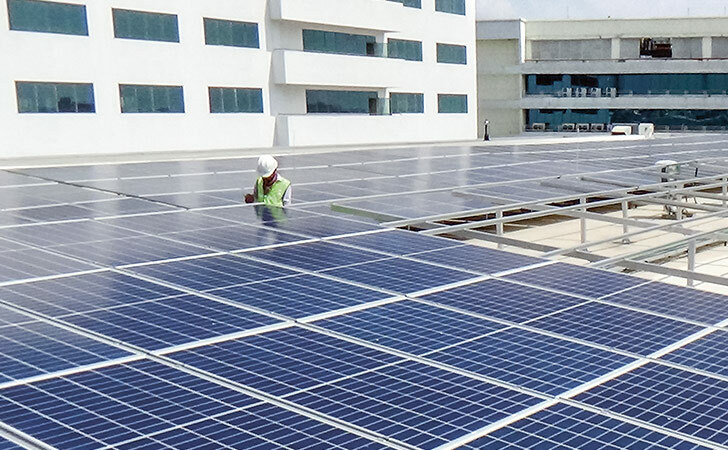 A solar power plant is being constructed on the roof of our new Bangalore office. We have recently stepped up such internal efforts as part of our Group-wide commitment to cover 100% of our power consumption from renewable sources by 2020. The Fairwinds building where we now have our offices fits the bill perfectly. Offering over 2 800 m2 of rooftop space, it has enabled us to build a solar power plant the size of ten tennis courts, comprising 1 058 individual solar panels. Over a full year, the installation will produce about 500 000 kWh of electricity. This translates into savings of INR 4.55 million (approx. USD 70 000) per year. With an estimated payback period of about 4 to 4.5 years, it is thus an economically viable investment with a stable long-term cash flow. The solar plant will also help save around 8 000 litres of diesel every year because the office will no longer need to use back-up generators when there are power cuts, which happens quite frequently in Bangalore. Finally, the panels help to cool down the temperature of the space immediately below the roof by 2 to 4 degrees Celsius. This will bring down the air conditioning load, thereby further reducing energy consumption and costs. All in all, we expect the solar power plant to save approximately 550 tonnes of CO2 emissions each year.